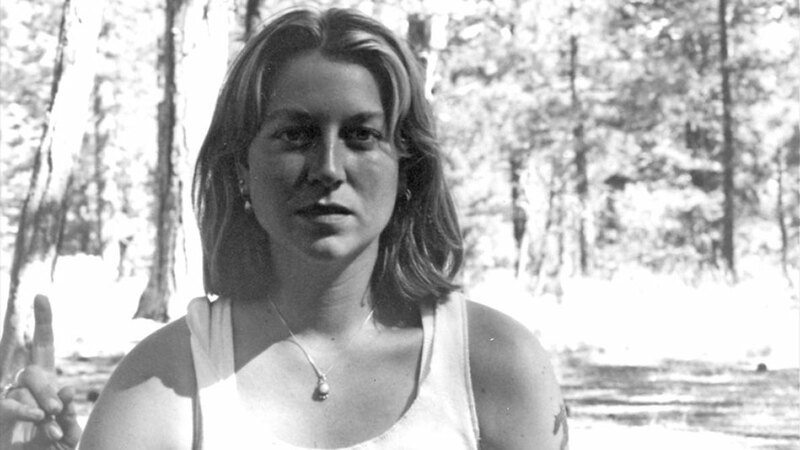 In this essay, Cheryl Strayed describes how she was affected by the loss of her mother to cancer when Strayed was twenty-two. She explores her descent into heroin addiction and unhealthy relationships and concludes the essay with a more hopeful outlook for her future. This essay would go on to be expanded into her best-selling novel Wild: From Lost to Found on the Pacific Crest Trail, which describes her 1,100 mile long journey for self-discovery and healing. The arc of this essay most closely resembles the Healing Journey. For more on this arc, click here. Strayed learns that her mother has cancer and will not live long. She returns home from college and stays by her mother’s side. Her mother declines even more rapidly than expected and Strayed feels immense grief at her loss. Strayed feels unmoored and afraid of living life without her mother. She tries to run from her feelings of grief by going to Portland to visit a friend. “Three years after my mother died I fell in love with a man who had electric blue hair. I’d gone to Portland, Oregon, to visit a friend, seeking respite from the shambles my life had become. I had thought that by then I’d have recovered from the loss of my mother and also that the single act of her death would constitute the only loss. It is perhaps the greatest misperception of the death of a loved one: that it will end there, that death itself will be the largest blow. No one told me that in the wake of that grief other griefs would ensue. I had recently separated from the husband I loved. My stepfather was no longer a father to me. I was alone in the world and acutely aware of that.” Strayed’s feelings of grief build upon one another for three years, which precipitates the aforementioned trip to visit a friend in Portland. Stayed “falls in love” with a man named Joe, who turns her onto heroin. She is attracted to him by the idea of mutual self-destruction, which is what she feels she deserves at this stage in her life. Her estranged husband arrives in Portland and tries to get her to come home. Strayed is threatened at knifepoint by a stranger and realizes that her heroin world will kill her if she stays. “We decided that we would get divorced. I hated him and I loved him. He had known my mother. I felt trapped, branded, held, and beloved. Like a daughter.” Strayed resolves to start her life anew, accepting the flaws of her own self and her past relationships. Strayed begins to see a therapist to work through her addiction. The process is not easy, but she remains committed to it, even as she has crippling dreams of heroin and cravings. “I dreamed of heroin. I woke in the middle of the night with a wanting so deep I was breathless. I had started seeing a therapist to talk about heroin. She told me that this wanting was normal, that indeed when you use heroin the brain responds by activating pleasure neurons that would normally remain dormant. She said it would take months for them to calm.” Strayed meets with Joe twice more and falters in her sobriety upon both meetings. During this second and final encounter with Joe, Strayed finally sees how sick he is making himself through his drug use and realizes she does not want to go down this road. She feels she is “in the presence of a dying man, a young dying man” and she decides to shut him and heroin out of her life forever. “First they were bitter and then they were bewildered and then they changed again to something else, to a state that I have had, finally, to see as heroic. Blue, blue eyes. Daggers of blue wanting and wanting. To stay, to stay.” The essay ends with a description of Strayed’s mother’s eyes as she passed away, but the emphasis on heroism and staying suggests that Strayed herself is pursuing her true self, as she goes on to explore in Wild. 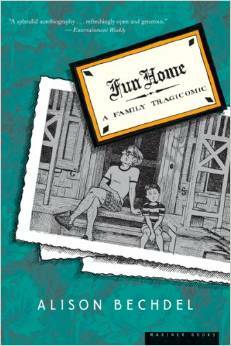 In this memoir, Alison Bechdel explores the relationship between her coming out as a lesbian during her college years and her distant father’s eventual suicide. She works to make sense of their relationship while she becomes increasingly aware of their similarities. She also tries to understand why her father chose to kill himself (if it was in fact suicide) and why he was never open about his sexuality as she is able to be. The arc of this memoir most closely resembles Victoria Lynn Schmidt’s Heroine’s Journey. For more on this arc, click here. While away at college, Bechdel realizes through works of literature she reads that she identifies as a lesbian and comes out to her parents in the form a letter, assuming that they will be accepting. Bechdel attempts to form a connection with her distant father about the shared subject of homosexuality through discussions of literature. They begin many conversations more obviously about sexuality that go unfinished. Her father dies in a possible suicide two weeks after her mother announces she wants a divorce. Bechdel feels responsible and thinks perhaps her coming out triggered him. She grapples with this question throughout most of the memoir. 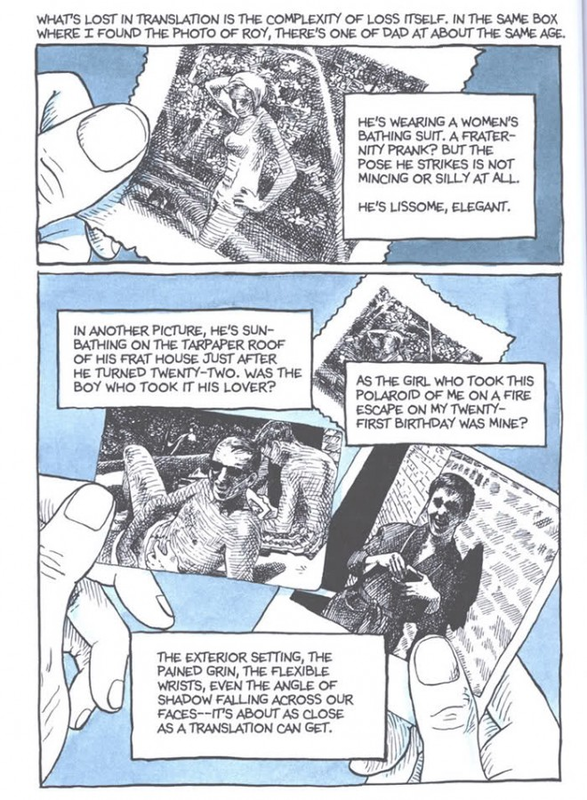 Bechdel finds an intimate photograph of her father at a young age posing in a position eerily similar to a photograph of herself that Joan has taken. She reflects on various memories from her childhood and begins to see her father in a new light, only now understanding his existence as a fully complex human being who grappled with his sexuality in a time before gay liberation. By the memoir’s end, Bechdel is able to understand her relationship with her father as a complicated inverse: “in the tricky reverse narration that impels our entwined stories, he was there to catch me when I leapt.” She feels closer to him although he is no longer present.